miniOrange provides a ready to use solution for Klipfolio. This solution ensures that you are ready to roll out secure access to Klipfolio to your employees within minutes. miniOrange provides secure access to Klipfolio for enterprises and full control over access to the application. Single Sign On (SSO) into Klipfolio with one set of login credentials. 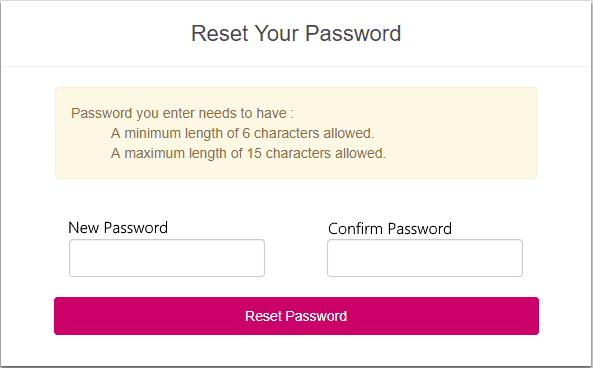 Secure your Klipfolio app from password thefts using multi-factor authentication methods with 15+ authentication types provided by miniOrange. Our multi-factor authentication methods prevent unauthorized users from accessing information and resources having password alone as an authentication factor. Enabling second-factor authentication for Klipfolio protects you against password thefts. End User first authenticates through miniOrange IdP by logging into miniOrange Self Service Console. The End User can log in to their Klipfolio account by clicking the Icon on the Dashboard. 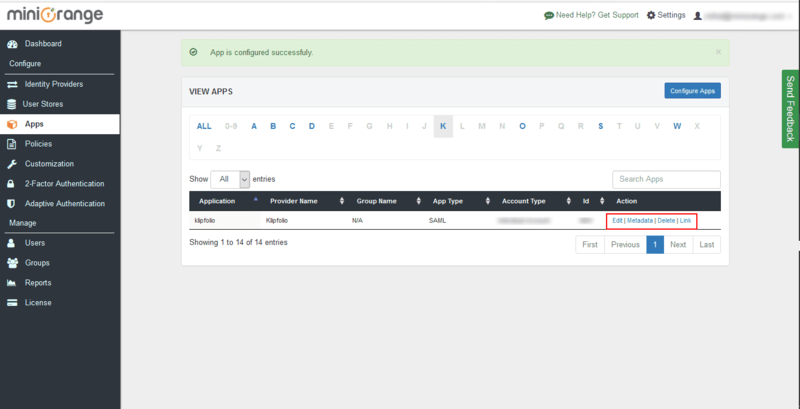 Go to Apps >> Manage Apps. To the Configure Apps button. Click on SAML tab. Select Klipfolio. 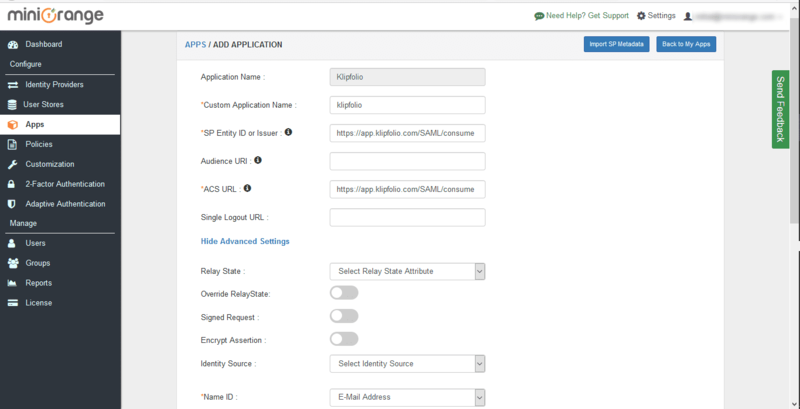 Enter the SP Entity ID as https://app.klipfolio.com/SAML/consume. Click on Show Advanced Settings. Against Relay State select Custom Attribute Value & enter https://console.aws.amazon.com. Add a new policy for Klipfolio. Select Klipfolio from Application dropdown. Select a Group Name from the dropdown - the group for which you want to add Klipfolio policy. 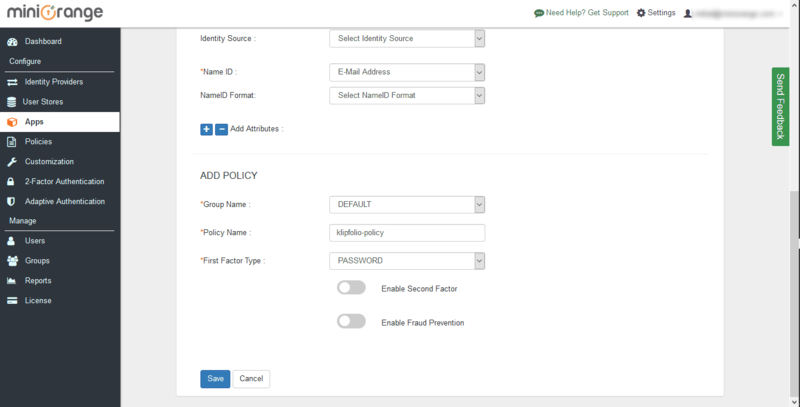 Give a policy name for Klipfolio in the Policy Name field. Click on Save to configure Klipfolio. Click on Metadata to download the certificate which you will require later. Login to your Klipfolio domain as the Account Administrator. Go to Account and select Settings. Then go to the Single Sign On tag and click on edit. 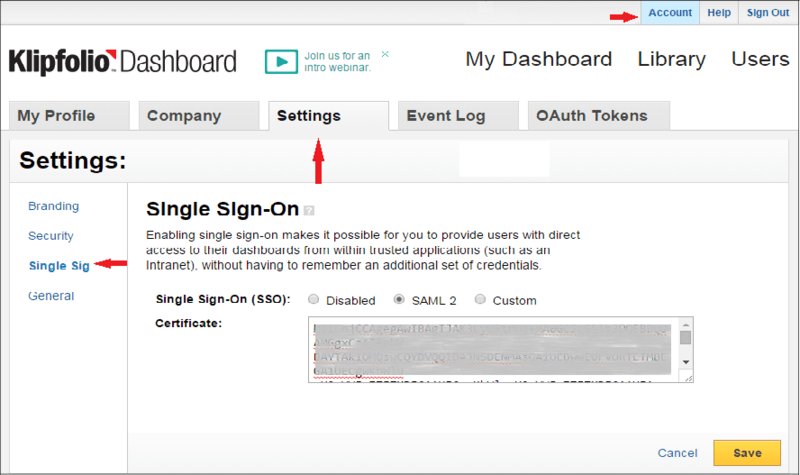 Select SAML 2 from the provided options. Open the certificate in notepad and copy the certificate information (except the BEGIN CERTIFICATE and END CERTIFICATE) in the Certificate field. Click on klipfolio application which you added, to verify your sso configuration.